When life gets busy we are often rushed, busy, and we forget to stop to smell the roses. 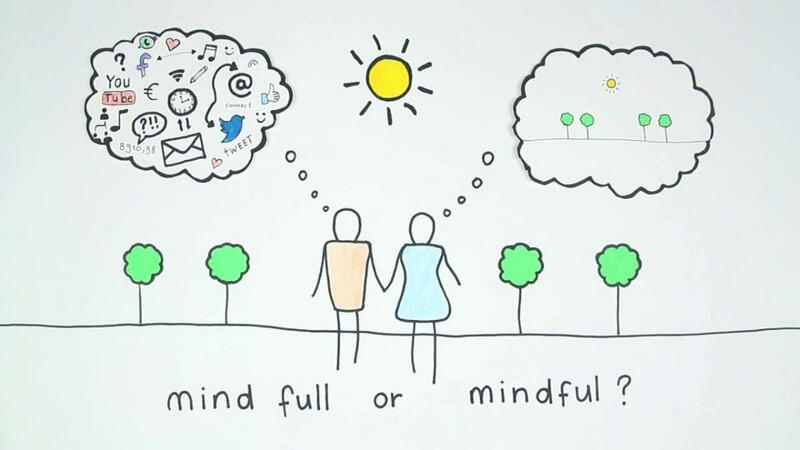 As the cartoon shows, the adult has a “mind full” and the child is being “mindful.” If you notice, the child has very little on their mind except what is in the moment; the flowers, sunshine, and looks to have a bounce in their step. The author of this cartoon has portrayed a common physical symptom of the “mind full” person, a rigid body stance. Learning how to practice mindfulness can help us to see more clearly the habits of our minds that create unnecessary suffering. When we are mindful, we are focusing our attention to the task at hand and we are not entangled in the past or the future, nor rejecting or clinging to what is occurring at the moment. (Germer, Siegel, et al.) This kind of attention to the present moment without worry generates energy, clarity, and joy. Mindfulness is not the goal in itself but the aim is of fostering freedom from suffering. As mindfulness deepens, wisdom and compassion are likely to arise, and these qualities naturally lead to psychological freedom.” (Germer, Siegel, et al.) Being mindful allows us to be less reactive to what is happening at the moment and our sense of wellbeing increases when our overall suffering diminishes. Practicing mindfulness allows us to see how fluid and ever-changing our lives are, including our sense of self. This insight liberates us from the constant need to promote ourselves in society. (Germer, Siegel, et al.) Over time, mindfulness helps us develop insight into our personal conditioning and how our mind functions. Mindfulness refers to the skill of open monitoring, Pali word vipassana, which means seeing clearly. Mindfulness can be practiced every day in an informal way, where any mental event can be an object of awareness. By directing our attention to our breathing, listening to ambient sounds in the environment, labeling our emotions, or noticing body sensations while brushing our teeth. (Germer, Siegel, et al.) Formal ways of practicing mindfulness are under the umbrella of “mindful mediation” in the West. First, find a quiet place and sit in a posture that is both upright and relaxed. Take a few slow, easy, deep breaths to settle your body and mind. Then let your eyelids gently close, fully or partially. Explore your body with your awareness and try to discover where you can feel your breathing most easily. Some people feel it around the nostrils, perhaps as a cool breeze on the upper lip. Others notice the chest rising and falling most easily, and still others feel the breath in the abdomen as the belly expands and contracts. Just feel the physical sensations of breathing in and breathing out. When you notice that your mind has wandered, just feel the breath again. There is no need to control the breath. Let your body breathe you---as it does naturally. Don’t worry how often your mind wanders. Each time you notice that your attention has gone elsewhere, simply return to the breath as you might redirect a toddler or puppy gone astray. When you wish to end your meditation, gently open your eyes. Locate your breathing where you can feel it most easily. Feel how the breath moves in the body, and when your attention wanders, gently re-turn to feeling the movement of the breath. After a few minutes, start to notice physical sensations of stress that you’re holding back in your body, perhaps in your neck, jaw, belly, or forehead. Also notice if you’re holding any difficult emotions, such as worry about the future or uneasiness about the past. Understand that every human body bears stress and worry throughout the day. See if you can name the emotion in your body. Perhaps a feeling of sadness, anger, fear, loneliness, or shame? Repeat the label a few times to yourself in a soft, kind voice, and then return to the breath. Now choose a single location in your body where stress may be expressing itself most strongly, perhaps as an ache in the heart region or tension in the stomach. In your mind, incline gently toward that spot as you might toward a newborn child. Continue to breathe naturally, allowing the sensation to be there, just as it is. Feel your breathing in the midst of your other body sensations. Allow the gentle, rhythmic motion of your breath to soften and soothe your body. If you wish, place your hand over your heart as you continue to breathe. When you’re ready, gently open your eyes. This exercise is designed to bring warmth and goodwill into your life. Sit in a comfortable position, close your eyes fully or partially, and allow your mind and body to settle with a few deep breaths. Put your hands over your heart to remind yourself that you are bringing not only attention but loving attention, to your experience. For a few minutes, feel the warmth of your hands and their gentle pressure over your heart. Allow yourself to be smoothed by the rhythmic movement of your breath beneath your hands. Now bring to mind a person or other living being who naturally makes you smile. This could be a child, your grandmother, your cat or dog-whomever brings happiness to your heart. Feel what its like to be in that being’s presence. Allow yourself to enjoy the good company. Next, recognize how vulnerable this loved one is-just like you, subject to many difficulties in life. Also, this being wishes to be happy and fee from suffering, just like you and every other living being. Repeat softly and gently, allowing the significance of your words to resonate in your heart. Should you notice your mind has wandered, return to the image of your loved one. Savor any warm feelings that may arise. Go slowly. Now visualize in your own body in your mind’s eye and feel the sensations of your body, just as they are. Notice any discomfort or uneasiness that may be there. Offer kindness to yourself. If you wish to use different phrases that speak more authentically to you, please do so. You can ask yourself, “What do I need to hear right now?” Use language that inclines the heart tenderly to yourself, as if you were relating to a beloved child or a dear friend. If emotional resistance arises, let it linger in the background and return to the phrases, or refocus on your loved one or your breath. Whenever you are ready, gently open your eyes. Germer, C. K., Siegel, R. D., & Fulton, P. R. (2016). Mindfulness and psychotherapy. New York: Guilford Press. Siegel, R. D. (2010). The mindfulness solution: Everyday practices for everyday problems. New York: The Guilford Press.